Feeling Randy I bought a Coke and a Fanta at the grocery store this weekend. 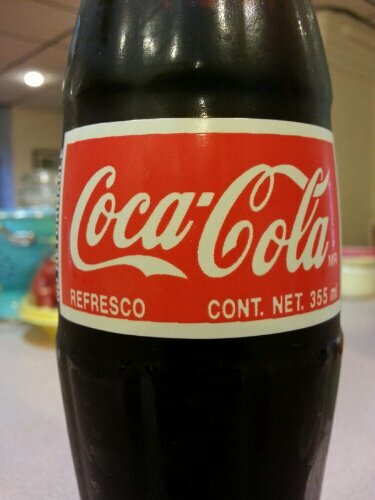 I’m not normally a soda person, preferring to get my excess calories from fun stuff like cake, but occasionally I make an exception for Mexican Coca-Cola products. How is it possible that these are so much better than their American counterparts? 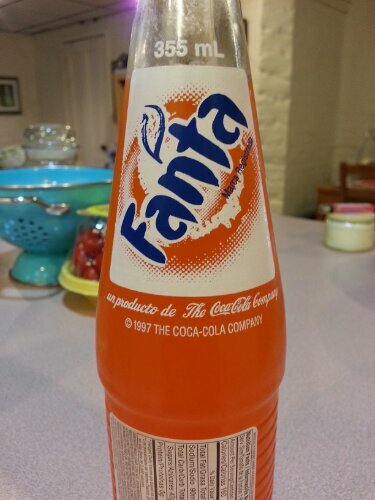 I find Coke sickly sweet and Fanta makes my teeth hurt but these manage to be sweet and refreshing. That may have something to do with their small, by American standards, bottle size as well since they click in at 355 ml they are the same size as cans making them easier to consume in a sitting than HFCS sweetened versions. I know that the corn industry insists they are the same but I do not agree. Come on America, we can do better! We shouldn’t have to import decent junk food from Mexico. On the other hand thank you for keeping my soda consumption to a minimum. I bought watermelon in order to make gazpacho (stay tuned) and the thing was a beast. After harvesting over three pounds of melon I was still left with more than half! What to do, what to do? Well, booze of course. 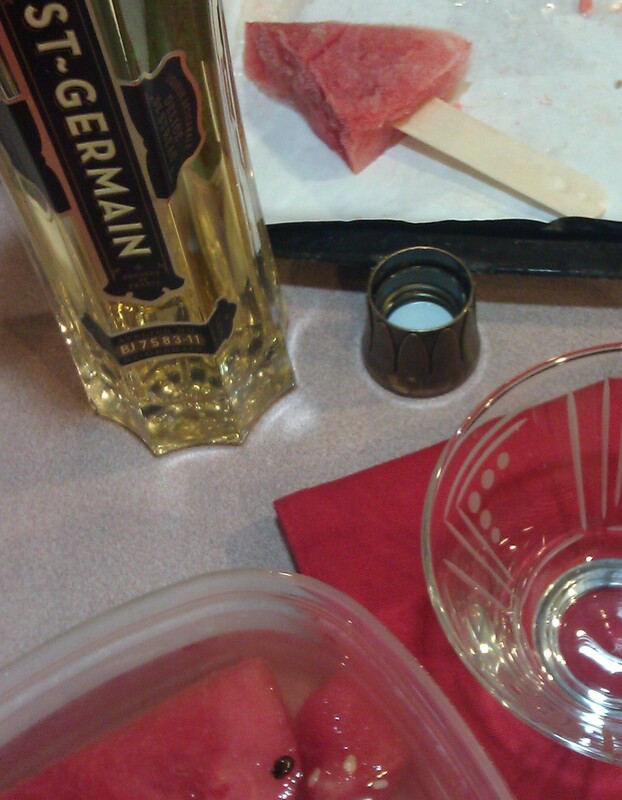 So, I got to slicing and soaking in St. Germaine, Vodka, and for a virgin option; lime juice. 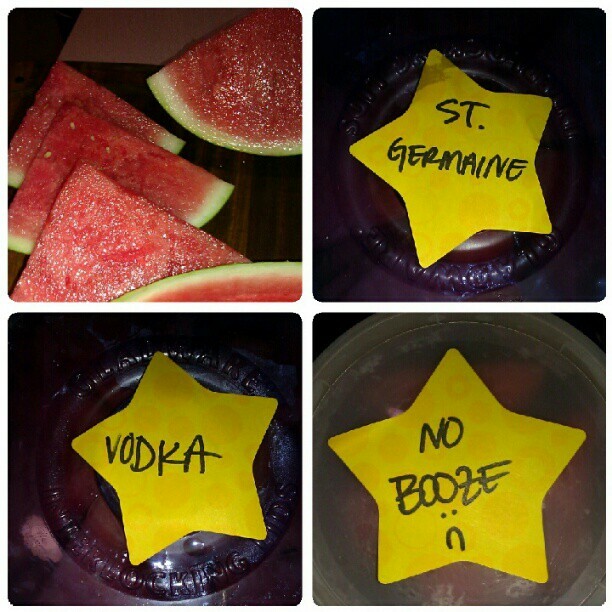 It’s as if the St. Germaine was made for watermelon; the floral notes marry the fruit so well. The vodka made the fruit in to a potent alcohol delivery vehicle. 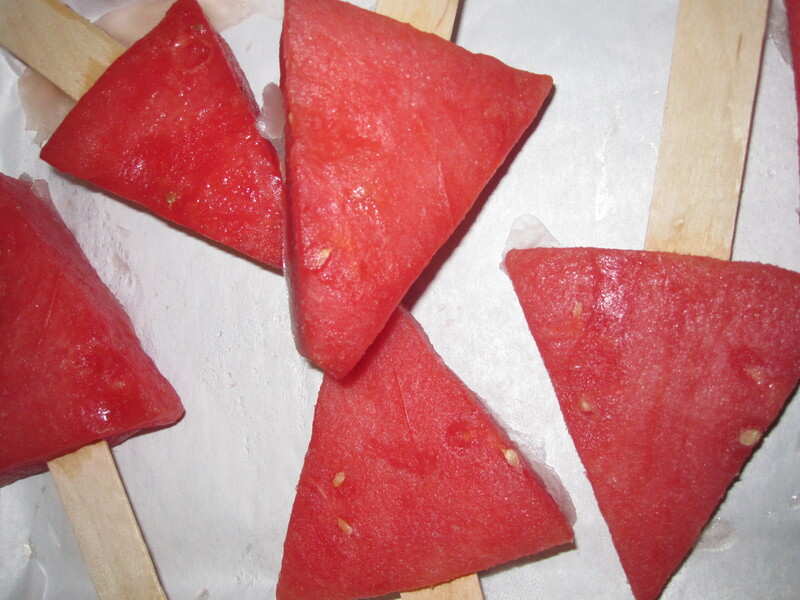 Cut your watermelon in to pop sized slices if you plan to freeze them. Otherwise go for bite-sized pieces. Place in shallow dishes or zip-top bags and top with alcohol or juice. Refrigerate over night. After soaking the fruit is ready to enjoy. My roommate and I ate the entire tub of St. Germaine fruit and washed down the soaking liquor not too soon after. One word: amazing. 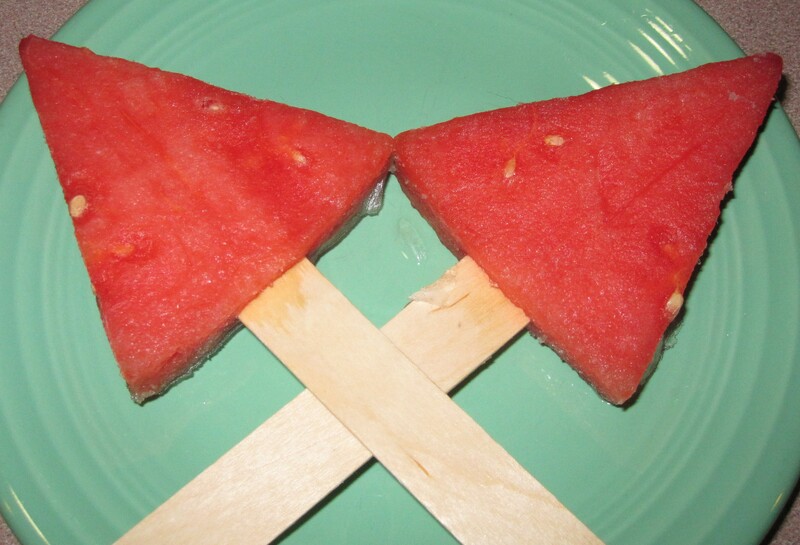 To make pops, insert sticks in to the wide end of your watermelon slices. Place the pops on a lined tray and freeze for at least four hours, preferably overnight. The St. Germaine pops were perfect and felt like popsicles, the vodka pops never quite froze solid but they were refreshing and delicious. With the leftover watermelon vodka I made a cocktail with equal parts St. Germaine (yes, more!) 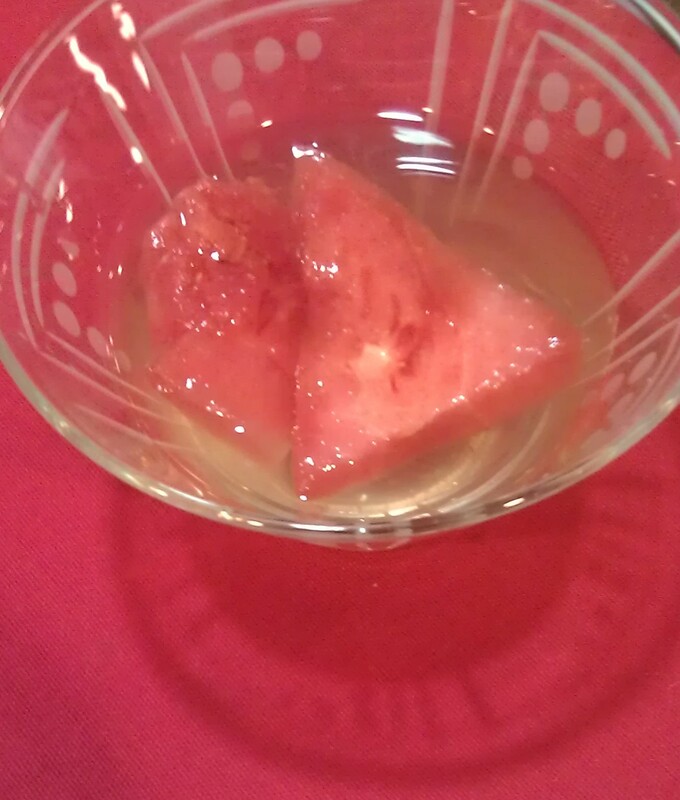 and watermelon vodka. I chopped one of the vodka pops in to ‘cubes’ to keep things cool. I also added a few pieces of vodka soaked melon. I made them small which turned out to be a great thing because the vodka soaked watermelon was incredibly strong making one drink more than enough. These are not so much recipes as a nudge in the right direction. I adapted the above from this which sounds delicious. Another virgin idea that sounds great is rose water or orange blossom water. Yum! I have one final watermelon post for you in the works.